The Cuvée Prestige series of Domaine Skouras is the very definition of comfort wines, as it includes three economical, flavoursome quality wines that can be served alone or accompany food, either everyday or on more formal occasions, practically matching any type of cuisine. 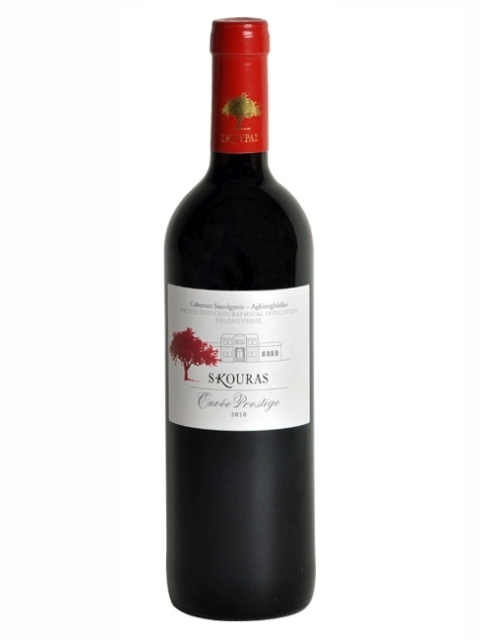 Cuvée Prestige red is an extremely flexible red wine from Agiorgitiko and Cabernet Sauvignon (90%-10%). Its wonderful youthful nose, which brings to mind fresh red fruit, strawberries and red gooseberries, is due to the distinct characteristics of Agiorgitiko, as well as to the fact that 30% of this wine is made using the carbonic maceration technique, which offers a wonderful, light, nouveau character. This red wine is ideally served alone, while it can also wonderfully accompany food: pasta, meat, risotto and appetizers based on tomato sauce. Its unique flexibility allows serving at various temperatures, depending on the season, the food and the mood: 14-16˚C, as most red wines, or even cooler (9-10˚C) when served in warmer climates or seasons. Clean, medium intensity, with aroma characteristics reminiscent of red fruits, strawberry, red currant, sweet spices, chocolate and wet leaves. Dry, medium acidity, medium tannins, medium (+) alcohol, medium body. Medium flavor intensity with flavor characteristics reminiscent of red cherry, sour cherry, vanilla, liquorice, cinnamon and herbal notes. Medium finish.